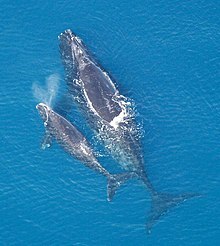 نهنگ شکار اطلس شمالی (Eubalaena glacialis) یکی از گونه‌های نهنگ شکار است که در اقیانوس اطلس زندگی می‌کند. ↑ Reilly, S.B. , Bannister, J.L. , Best, P.B. , Brown, M. , Brownell Jr. , R.L. , Butterworth, D.S. , Clapham, P.J. , Cooke, J. , Donovan, G.P. , Urbán, J. & Zerbini, A.N. (۲۰۰۸) Eubalaena glacialis In: IUCN 2009. IUCN Red List of Threatened Species. Version 2009.1. www.iucnredlist.org Retrieved on 22 August 2009.